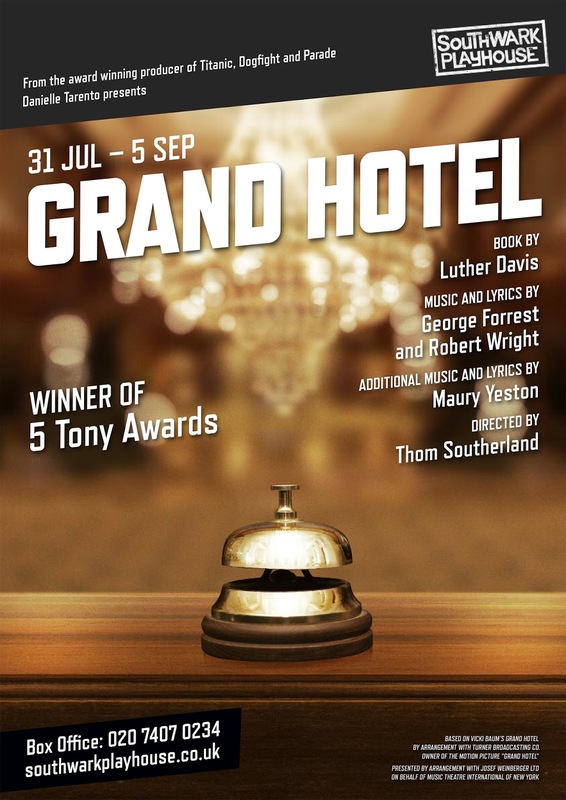 Full casting is announced for the new London production of the acclaimed Broadway musical Grand Hotel, produced by Danielle Tarento and directed by Thom Southerland, the award-winning tream behind Titanic, Parade and Mack & Mabel. Grand Hotel will open for a 6-week season at Southwark Playhouse from Friday 31 July. The Grand Hotel in 1928 Berlin is bustling with eccentric and sometimes dubious guests: amongst them a fading prima ballerina being forced to dance again; a fatally ill Jewish bookkeeper who wants to spend his final days living in luxury; a young, handsome, but destitute Baron; a cynical doctor suffering from World War I wounds; an honest businessman going bad as he faces financial ruin and a typist dreaming of Hollywood stardom. Over the course of a weekend, their extraordinary stories interweave with each other and the hotel’s hard-working staff. Grand Hotel, Book by Luther Davis, Music and Lyrics by George Forrest and Robert Wright, Additional Music and Lyrics by Maury Yeston, premièred on Broadway in 1989, ran for over 1,000 performances and was nominated for 12 Tony Awards, winning five. The Sound of Music (Rome). Scott Garnham (Baron Felix Von Gaigern) has just played Edgar Beane in the transfer of Titanic to the Princess of Wales Theatre in Toronto. His West End roles include Buddy Cortina in Made in Dagenham (Adelphi) and covered Liam O’Deary in I Can’t Sing! (London Palladium). George Rae (Otto Kringelein) was Timon in Disney’s The Lion King, TJ in Sister Act; Ko-Ko in The Mikado (UK tour) and had featured roles in Whisky Galore - A Musical!, Kiss Me Kate and Company. Victoria Serra (Flaemmchen) has just played Kate McGowan in the transfer of Titanic to Toronto, a role she created in London. Her other leading roles include Sophie in Mamma Mia! (international tour) and Jenny in Love Story (Union). Philip Rham (Colonel-Doctor Otternschlag) has just played Captain Smith in the transfer of Titanic to Toronto, a role he created at Southwark Playhouse. He was also Judge Roan in Tarento’s Parade at Southwark Playhouse. Jacob Chapman (Hermann Preysing) West End credits include playing the rebel leader in We Will Rock You (Dominion) and Combeferre and understudy Jean Valjean in Les Misérables (Queens). Other roles included Pish-Tush in The Mikado (Charing Cross) and Henri in Carnival Of The Animals (Riverside Studios). Valerie Cutko (Raffaela) played Mrs Mullin in Carousel at Arcola theatre and Fraulein Kost in Cabaret, directed by Rufus Norris. She was in the original Broadway cast of Grand Hotel. Jonathan Stewart (Erik) has just played George Button in A Damsel in Distress at Chichester Festival Theatre. He was Pinocchio in the original West End cast of Shrek. James Gant (Rohna/Zinnowitz) has recently played both Jean Valjean and Javert in Les Misérables in the West End. He had featured roles in Evita, Jekyll & Hydeand Oliver! (UK tours). Charles Hagerty (Sandor/Chauffeur) was in the original Broadway cast of If/Then. His other major musicals include Wicked, Jesus Christ Superstar and Les Misérables. Paul Iveson (Witt) has been in Jersey Boys (West End), Annie Get Your Gun (Young Vic) and Hello, Dolly!, (Regents Park, Open Air Theatre). The rest of the cast are: Rhiannon Howys, Jammy Kasongo, Ceili O’Connor, Durone Stokes, Samuel J Weir, Leah West. Thom was longlisted Best Newcomer in the 2011 Evening Standard Awards for Parade. He was named Best Director at the 2011 The Off West End Awards for Me And Juliet at the Finborough. He directed Titanic, Victor/Victoria, Mack & Mabel and Parade (Southwark Playhouse); the European première of Jerry Herman’s The Grand Tour (Finborough); The Mikado (Charing Cross Theatre); Daisy Pulls It Off, Irving Berlin’s Call Me Madam! (Upstairs At The Gatehouse); the European première of I Sing!, Divorce Me, Darling!, Annie Get Your Gun, The Pajama Game and sold-out all-male adaptations of Gilbert and Sullivan’s HMS Pinafore and The Mikado (Union); Noël And Gertie (Cockpit); the European première of The Unsinkable Molly Brown (Landor); and the European première of State Fair (Finborough & transfer to Trafalgar Studios). His production of Titanic has just completed its North American première in Toronto. Danielle was named Best Producer at the 2012 Off West End Awards and nominated Producer of the Year at the 2015 Stage awards. Her production of Titanic at Southwark Playhouse won Best Off West End Production at the 2014 Whatsonstage Awards and Best Musical Production at the 2014 Off West End Awards. It has just completed its Canadian premiere in Toronto. She has also produced Gods And Monsters, Dogfight, Victor/Victoria, Mack & Mabel, Parade, Company and Three Sisters at Southwark Playhouse; The Grand Tour (Finborough); Taboo (Brixton Clubhouse); The Pitchfork Disney (Arcola); Burlesque, Drowning On Dry Land (Jermyn Street); Noël And Gertie (Cockpit). She is co-founder of the Menier Chocolate Factory. Her production of Titanic has just completed its North American première in Toronto.